The Brownells YouTube channel has been terminated (shut down) without warning or notice from either YouTube or its parent company, Google. 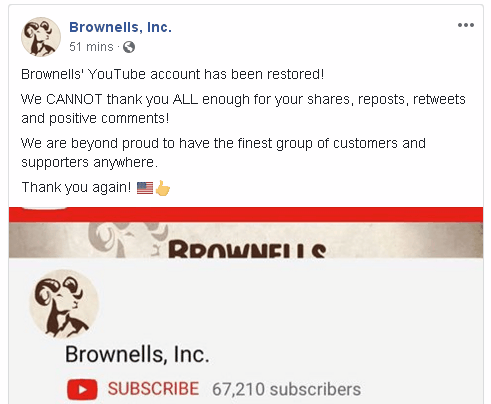 On June 9, 2018, at roughly 2:00 am, the Brownells channel was pulled from YouTube. This removed ALL Brownells YouTube content, including videos that cover firearms safety, hunting skills, firearms maintenance, and marksmanship. YouTube didn’t simply block Brownells’ gun sales-related videos — it shut down the entire Brownells channel, which had offered nearly 1800 helpful videos. The Brownells channel had acquired over 67,000 subscribers since its launch in January 2007. Ars Technica reported: “YouTube is placing more restrictions on weapons-related videos, focusing on guns with new, forthcoming policy changes. According to a Bloomberg report, YouTube intends to ban videos that ‘promote or link to websites selling firearms and accessories’, including bump stocks, beginning this April. The new policy will also prohibit instructional videos that detail how to build firearms. YouTube took similar action after the Las Vegas shooting last year by banning gun-modification tutorials. Current YouTube Policies on Firearms Content are displayed below. (Read More). Share the post "YouTube Terminates Brownells YouTube Channel — Then Relents"
You want regulation of your business? Because this is how you get regulation. I can only imagine that Senators Grassley and Ernst of Iowa have gotten a few phone calls and emails. Well … that is the liberal left for you. The fascist show their true colors and what they think of free exchange of ideas and thought. To hell with these communists! Brownells videos remain available on their own website – see https://www.brownells.com/guntech/default.htm – and, if you search, also on YT. Seems possibly “only” the front door was closed. TBD. Funny thing, you can search YouTube for Brownell and guess what all the videos come up. Who is right about this? Editor: You logged in right after the Brownells Channel was restored in late afternoon on Sunday. The Channel was indeed “terminated” per YouTube’s message, starting in the wee hours of the morning on Saturday. YouTube channel 8541 Tactical received a community strike today for a video he posted seven years ago. John has 83k Subs. the war is near not over. all guns will be banned on mainstream media. if we want feedom we must fight for it not only in court but also in media. but new platform, like youtube, with gun channels will be needed. but now NRA should push on youtube for banning such channels. And returning to the real life, meeting people, living your life, being different and becoming HAPPY again with real friends ! You Tube is wrong. Stop playing god because your views don’t agree with mine. Already stopped using Facebook. Is you tube next? The writing was on the wall when Laura Ingraham had to apologize to the little piece of crap Davey Hogg and his LGBT shaved head cuban harlot. It was like Ann Coulter kneeling before Al Franken: unbelievable! Boycott all the vicious bastards who want to grab our guns. This all started when Trump got elected and the poor liberal loosers realized why… They spent all thier energy controlling the narative on mainstream TV but not YouTube. All the while YouTubers voiced thier anti Hilary opinions that ultimately influenced the election. The media was in shock and so were the Libs. So now they again need to control the narative.. So they are going after the anti narative voices on YouTube. It’s not just gun channels either. They are going after anyone who is not regurgitatine the “officiel narative” or whatever than means at the time. Shutting down YouTubers is nothing if not a direct attack on the US Constitutional rights to free speech and the right to firearms. The news and youtubers can demonize firearms all day long but YouTube will not allow the counter opinion to be heard and the only information available on firearms will be negative. What a failing democracy it all is. Someone said that ; “Evil triumphs when good men do nothing”. In this case , good men did do something , and the result became immediately apparent . This is the tact , and action we must take every time the anti-gun left makes these attacks on our freedoms . It is up to us , in the final analysis , to continue to fight these liberal progressives at every turn , and not give in . Not one single inch .